Each Exotic Crosshair holster is leather lined and covered on both the front and the back with your choice of skins. 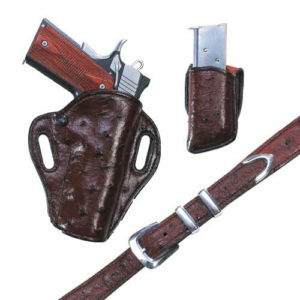 The holster features a tension screw and hand molding to bring out both the form of the gun and the beauty of the hide. Flat-Black construction for all day comfort. 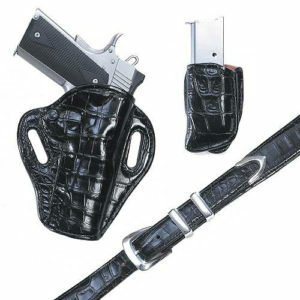 This Tapered belt is lined and designed to be heavy enough to carry a pistol comfortably and securely. 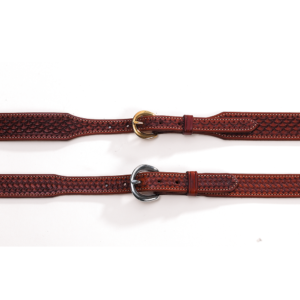 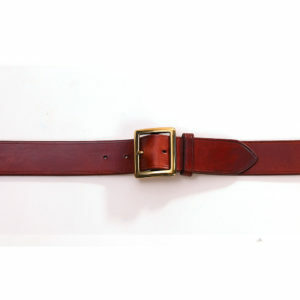 Premium cowhide lining adds strength to the belt without the added bulk of a heavy gunbelt. 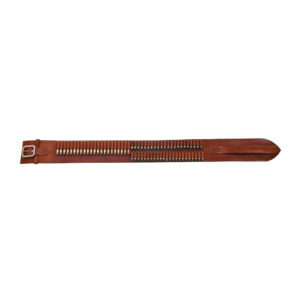 A beautiful belt for dress even without a holster. This single concealment pouch is leather lined and completely covered in the exotic skin of your choice.